If the piece to be milled is not completely made out of sheet materials and you want to process blocks, cylinders, cast parts or (re)-work previously processed pieces also, these will usually be secured in a bench vice, or held steady with clamping jaws on the machine table. If the entire surface is not intended to be worked on, the piece must be precisely aligned. Therefore, you must not just measure the Z-height, but also the position of the piece in the X and Y directions. In the simplest scenario this can be done by „Adjusting“ the surface with the tool itself again. You should progress laterally on the border of the piece until the tool touches the corner. Now the axis of the cutter is half the diameter away from the surface. So if you are proceeding in the X-direction toward the border and the tool diameter is 6 mm, then the midpoint of the cutter is 3 mm away from the border. Double click on the X-coordinates display and enter „-3“. The same process is of course required for the Y and Z coordinates. The measuring process can be automated if you possess a 3D probe. Unlike the height sensors, the 3D probe also reacts to input from the page and is placed in the tool’s spindle. For the lateral approach of the piece’s borders the „Corner Finder“ macro can be used. The 3D probe can also be used to measure drillings as a reference point. The point of the 3D probe must be placed in the drilling. The „Centre Finder“ macro probes the walls of the drilling in several places and thereby establishes the position of the drilling’s centre. After the macro has been run, the point of the probe is precisely in the centre. Afterwards, the X and Y coordinates can either be set at zero or (by double clicking) to the known coordinates of the reference point. An alternative method to establish corners or drilling positions is the use of a miniature camera as a centring microscope. 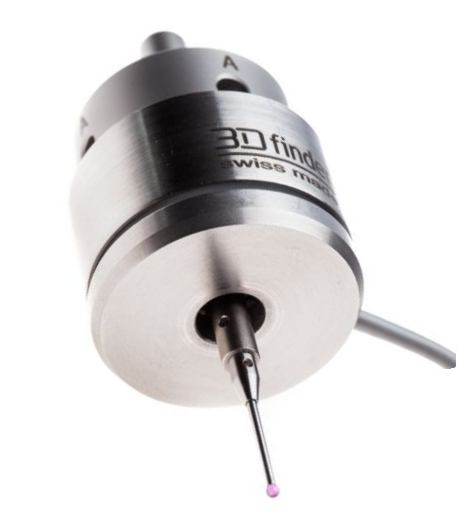 There are special cameras which can be used specifically for this available is stores, usually with a USB connection and a cylindrical shaft which can also be used for recording the tool spindle.